In 1966, Charles Gordon, great-grandson of William Grant the famous founder of Grant’s whisky, fancied buying two stills at auction. It took him 33 years to know what to do with these rarities from the nineteenth century, the Carter-Head and the Bennet. This gin is the creation of the eccentric grandson William Grant. In 1988, he met Lesley Gracie, passionate about botany, and took her on his eccentric quest. His wish was to create an elixir with his two old stills. Various distillates were created but none of them matched up the expectations of Mr. Gordon and Ms. Gracie. They did not give up. Eventually, in 1999, they developed a kind of “special delight" by simultaneously running the two stills with an original harmony of aromatic plants to which they added infusions of cucumber and rose. 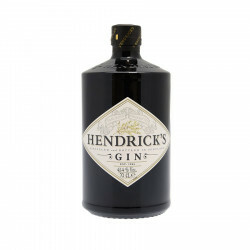 Against all expectations, they managed to create the strange perfection that became Hendricks gin.